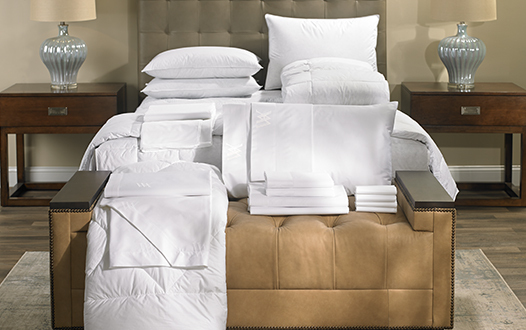 Enjoy legendary Waldorf Astoria style at home with our signature bed and bedding set. Included is the renowned Waldorf Astoria Bed, featuring our custom-designed hotel mattress and box spring. 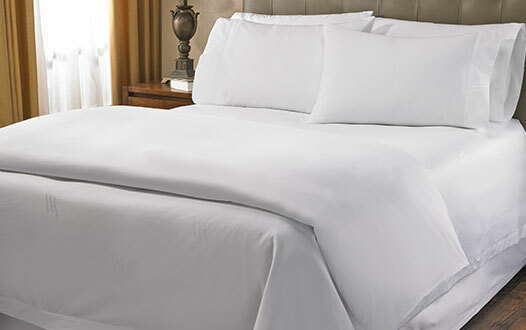 For your home, we dress the Waldorf Astoria Bed in a particularly unique way, starting with the mattress topper, fitted sheet, flat sheet, down blanket, and finally our signature top sheet that's printed with the Waldorf Astoria monogram. Fold our down duvet comforter and cover at the foot of the bed to capture our distinct guest room style. Four feather and down pillows, both firm and soft, come with pillow protectors and our signature cotton pillowcases, which feature an embroidered Waldorf Astoria monogram. With this sumptuous set, you’re poised for sophisticated comfort.